Searchlight, the group behind the anti-BNP 'HOPE not hate' campaign, have today published Fear and HOPE, a report examining British attitudes towards culture and identity in the 21st century. Searchlight, the group behind the anti-BNP ‘HOPE not hate‘ campaign, have today published Fear and HOPE, a report examining British attitudes towards culture and identity in the 21st century. Based on 5,054 discrete interviews with a cross section of British society, it paints a fascinating and concerning picture. Therefore, while extremist, fascist and racially-motivated political forces remain a matter of concern, the report warns that these are likely to be consumed within a “new politics of identity”, potentially by movements which enjoy a level of superficial respectability. 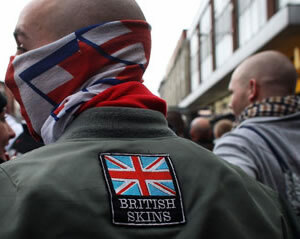 The EDL and UKIP are identified as groups which are adapting well to the new post-immigration environment, whilst the BNP are described as having “failed to adapt” and “sinking under the weight of their own negative image”. • There is popular support for a sanitised, non-violent and non-racist English nationalist political party. • There is a real appetite for a positive campaigning organisation that opposes political extremism through bringing communities together. More than two-thirds of the population would either ‘definitely’ or ‘probably’ support such a group. What, then, can be done about the threat of far right identity politics? These people are less financially secure and less optimistic about the future. They are more likely to be working class, to live in social housing and to view immigration through the prism of its economic impact on their opportunities and the social impact on their communities. Muslims and other BME (Black Minority Ethnic) groups are more prevalent here as are the largest single segment of those who identify with Labour. Generally older and more prosperous than other groups, many are (or have been) professionals and managers. They are more likely to view immigration as a cultural issue with concerns about the impact of immigration on national identity and about immigrants’ willingness to integrate. This group forms the largest segment of those identifying with the Conservative Party. Together, these two groups comprise more than half the population and they should, according to the authors, be considered “the mainstream”. Searchlight also advise that attempts to address right-wing extremism should focus on building a “firewall” between these two groups and the far right, something which mainstream political parties are largely failing to do. Ed Miliband’s approach receives an even colder welcome. The Populus survey does not support the assertion that there is a ‘progressive’ majority. It suggests that there is a solid anti-progressive block (47% – Cultural Integrationists, Latent Hostiles and Active Enmity), a solid progressive cohort (24% – Confident Multiculturals, Mainstream Liberals), and a rump (28% – Identity Ambivalents) which simultaneously displays progressive and non-progressive attitudes. The report identifies a serious risk that Identity Ambivalents, the single largest group, will feel sidelined by Mr Miliband’s focus on the “progressive majority” and unmoved by Cameron’s “muscular liberalism”. Moreover, their alienation is likely to be exacerbated by Mr Cameron’s economic policies. • They are less likely than Cultural Integrationists to see violence, or the threat of violence, as sufficient to make them change their mind about supporting a campaign. “The core message of hope contained within [the report] is that people share a common sentiment, a search for a common life even – built on a desire for belonging and security, which does indeed create possibilities for an optimistic ‘new politics’ but only if the mainstream political parties step up. Having explained the outdated nature of traditional approaches to issues of culture and identity, the report lays down an important challenge to Labour. Failure to engage Identity Ambivalents in a productive dialogue will not only hamper the party at the ballot box, it could have serious consequences for cohesion across the country. Todays news and tomorrows chip paper. Lowles (not his real name) the Gables and Searchlight need to make money out of this. How much are they going to hawk this report for and charge for appearances? Its about as much use as an ‘ashtray on a motorbike’. Searchlight like alot of ‘charities’ these days are grasping charlatans. Having read the report one could conclude ‘is the pope a catholic’. Carry on mugging the left off Searchlies.